The only man to ever try to take Rome with a cavalry charge was also the man whose command post of a ship on the Rhine was stolen out from under him by a Batavian special boat squadron. While visiting a lady friend his camp was attacked by a huge barbarian army, and an under-dressed Cerialis had to first fight his way into the camp before organizing the defence. These escapades mark the highlights and low points of Cerialis' career as a top Roman general of the first century AD. In this book we travel from Boudicca's Britain to Nero's Rome and out to the bogs and forests of the Rhine frontier. In part a biography of a remarkable general, this is also a description of what it took to command the legions of Rome in the name of the Caesars. I've always liked Petellius Cerialis. Being absent from one's post may be excusable if one has chosen to slip away for a romantic liaison, but it becomes less excusable when that post is an army camp in hostile territory. Especially when you are the camp commander and the camp is unexpectedly attacked. Cerialis saved the day by fighting his way back into camp and taking charge, though by some accounts he was wearing little more than a determined expression and a borrowed helmet. But that was Cerialis all over. There was a certain quixotic appeal about doomed military operations such as him trying to take Rome by a cavalry charge, or standing up to Boudicca's hordes with half a legion. Yet this same man commanded one of the largest armies ever mustered by the Roman empire, and did so with flawless efficiency in his Rhineland campaign. As governor of Britain he conquered the Brigantine tribe and founded what was to become the great city of York. These contradictions drew me into a study of what made Roman generals tick,and the book ended up as a description of what it meant to command the legions of Rome, with Cerialis as a case study. 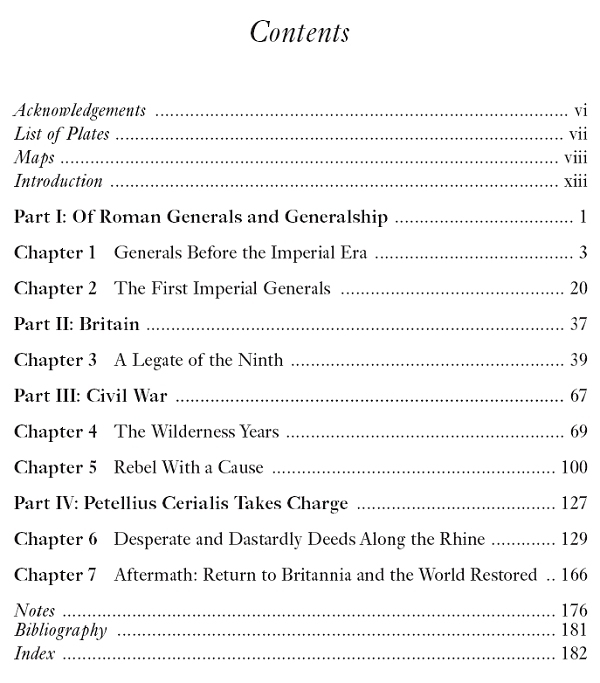 For me, one of the most enjoyable aspects of the book was the enthusiasm the Petellius project generated, from museum staff and university academics to re-enactment groups. I received help from all of these people and others, and can't thank them enough.